An eyespot (sometimes ocellus) is an eye-like marking. They are found in butterflies, reptiles, cats, birds and fish. Eyespots may be a form of mimicry in which a spot on the body of an animal resembles an eye of a different animal to deceive potential predator or prey species; a form of self-mimicry, to draw a predator's attention away from the most vulnerable body parts; or to appear as an inedible or dangerous animal. In larger animals, eyespots may play a role in intraspecies communication or courtship – the most well-known example is probably the eyespots on a peacock's display feathers. Eyespots are not necessarily adaptations, but may in some cases be spandrels, accidental artefacts of pattern formation. The morphogenesis of eyespots is controlled by a small number of genes active in development of a wide range of animals, including Engrailed, Distal-less, Hedgehog, and the Notch signaling pathway. 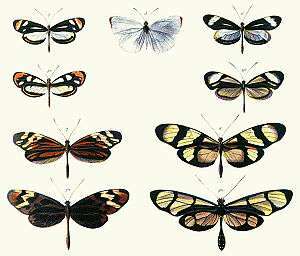 The eye-like markings in some butterflies and moths, like the Bicyclus anynana, and certain other insects, as well as the Sunbittern (a bird) do not seem to serve only a mimicry function. In some other cases, the evolutionary function of such spots is also not understood. There is evidence that eyespots in butterflies are antipredator adaptations, either in deimatic displays to distract, startle or scare off predators, or to deflect attacks away from vital body parts. Butterfly eyespots may also play a role in mate recognition and sexual selection. 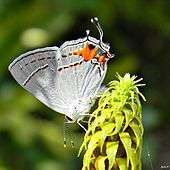 Many butterflies such as the blues (Lycaenidae) have filamentous "tails" at the ends of their wings and nearby patterns of markings on the wings, which combine to create a "false head". This misdirects predators such as birds and jumping spiders (Salticidae). Spectacular examples occur in the hairstreak butterflies; when perching on a twig or flower, they commonly do so upside down and shift their rear wings repeatedly, causing antenna-like movements of the "tails" on their wings. Studies of rear-wing damage support the hypothesis that this strategy is effective in deflecting attacks from the insect's head. Some reptiles, such as the sand lizard of Europe, have eyespots; in the sand lizard's case, there is a row of spots along the back, and a row on each side. Male birds of some species, such as the peacock, have conspicuous eyespots in their plumage, used to signal their quality to sexually selecting females. The number of eyespots in a peacock's train predicts his mating success; when a peacock's train is experimentally pruned, females lose interest. Several species of pygmy owl bear false eyes on the back of the head, misleading predators into reacting as though they were the subject of an aggressive stare. Some members of the cat family Felidae, such as the leopard cat and leopard, have ocelli, white circular markings on the backs of the ears. Ocelli serve social functions, such as signaling to kittens, and communicating the cat's mental state to conspecifics in the gloom of dense forest or in tall grass. Some fish have eyespots. The foureye butterflyfish gets its name from a large and conspicuous eyespot on each side of the body near the tail. A black vertical bar on the head runs through the true eye, making it hard to see. This may deceive predators into attacking the tail rather than the more vulnerable head, and about the fish's likely direction of travel: in other words, the eyespot is an example of self-mimicry. For the same reason, many juvenile fish display eyespots that disappear during their adult phase. Butterfly eyespots are formed during embryogenesis as a result of a morphogenetic signaling center or organizer, called the focus. This induces neighboring cells to produce specific pigments which pattern the eyespot. Early experiments on eyespot morphogenesis used cautery on the butterfly wing eyespot foci to demonstrate that a long range signaling mechanism or morphogen gradient controlled eyespot formation in both space and time. The findings cannot be explained by a simple source/diffusion model, but could be explained by either 1) A source/threshold model, in which the focus creates the morphogen, or 2) the sink model, in which the focus generates a gradient by removing a morphogen which was created elsewhere. Several genes involved in eyespot formation have been identified that can fit into these models, but only two of them have been functionally tested. These genes are the transcription factor Distalless (Dll) and the ligand (a signaling substance that binds a cell surface receptor) Hedgehog (Hh). Butterfly eyespot morphology appears to be the result of the evolution of an altered version of the regulatory circuit which patterns the wings of other insects. This rogue regulatory circuit is able to pattern both the anterior and posterior eyespots independent of the usual anterior/posterior wing compartmentalization restrictions seen in the fruit fly Drosophila. The altered regulatory circuit redeploys early developmental signaling sources, like the canonical hedgehog (Hh) pathway, Distal-less (Dll), and engrailed (En), breaking the anterior/posterior compartmentalization restrictions through increased localized levels of Hh signaling. In turn, this raises expression of its receptor Patched (Ptc) and transcription factor. Normally, in Drosophila, engrailed acts in the posterior compartment to restrict Ptc and Cubitus interruptus (Ci) expression to the anterior compartment by repressing transcription of Ci, thereby preventing Ptc expression. From the perspective of evolutionary developmental biology, understanding the redeployment and plasticity of existing regulatory mechanisms in butterfly eyespot locus development has given more insight into a fundamental mechanism for the evolution of novel structures. The Distal-less gene is present in almost all eyespot organizers, making it an ideal candidate to carry out major functions of eyespot formation. During the wing imaginal disc development Dll, has two expression domains separated by a temporal component. First Dll is expressed in a group of cells in the center of what will become the focus and eventually the eyespot. This expression starts during the middle of the fifth instar larva and lasts until the pupal stage. The second domain starts around 20 hours after pupation around the original central cluster of cells, in an area in which a black ring of the eyespot will be formed. Functional experiments using transgenic Bicyclus anynana (the squinting bush brown butterfly) have shown that overexpression or down-regulation of Dll in the first expression domain correlates with bigger and smaller eyespots respectively. However, if this is done on the second domain then the overall size of the eyespots remains the same, but the width of the black ring raises with a higher amount of Dll. This suggests that Dll might be responsible for the differentiation of the focus in the first expression domain and might be involved in establishing the ring color patters in the second domain. These experiments together with the wide distribution of Dll across eyespot forming butterflies suggest that this transcription factor is a central regulator for the correct patterning of the eyespots. 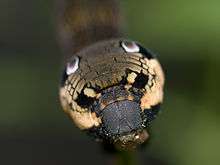 The Hh gene is the other element that has been functionally tested in the formation of eyespots. Investigating genes involved in wing development and morphogenetic activity has led to the discovery that Hh has a primary role in the morphogenetic signaling center of the foci. In a manner that is similar to the development of Drosophila fruit flies, Hh is expressed in all cells in the posterior compartment of the developing butterfly wing during the mid fifth instar of butterfly wing development. However, in butterflies, Hh expression is significantly higher in those cells that flank the potential foci. Higher transcription levels of Hh, along with other known associates of the Hh pathway, namely patched (Ptc) the Hh receptor, and cubitus interruptus (Ci), the Hh transcription factor is seen throughout the mid to late fifth instar as well, which further implies a role for Hh signaling in eyespot development and patterning. Furthermore, cells that are flanked by the cells expressing the highest level of Hh signaling are fated to become the foci, indicating that focus cell fate determination relies on high concentrations of Hh in surrounding cells. However this observation has not been totally confirmed as a rule for multiple butterfly species. Studies tried to extrapolate the result of Hh pathway involvement by looking for the expression of Ci in Bicyclus anynana. Here they observed that both seem to be expressed in eyespots, suggesting a relation with the Hh signaling pathway. However, other studies did not find evidence of Hh expression in B. anynana. The Notch (N) gene expression precedes an upregulation of Dll in the cells that will become the center of the focus. This makes N the earliest developmental signal, so far studied, that is related with the establishment of the eyespots. Loss of N completely disrupts Dll expression, and eventually eyespot formation, in several butterfly species. A variety of other wing patterns are determined by N and Dll patterns of expression in early development of the wing imaginal disc, suggesting that a single mechanism patterns multiple coloration structures of the wing. Wikimedia Commons has media related to Eyespot. ↑ Costanzo, K.; A. Monteiro (2006). "The use of chemical and visual cues in female choice in the butterfly Bicyclus anynana". Proceedings Royal Society: Biological Sciences. 274: 845–851. doi:10.1098/rspb.2006.3729. ↑ "Reptile ID guide". Amphibian and Reptile Group. Retrieved 11 April 2016. ↑ Petrie, Marion; Halliday, T.; Sanders, C. (1991). "Peahens prefer peacocks with elaborate trains". Animal Behavior. 41 (2): 323–331. doi:10.1016/S0003-3472(05)80484-1. ↑ Petrie, M. (1992). "Peacocks with low mating success are more likely to suffer predation". Animal Behaviour. 44: 585–586. doi:10.1016/0003-3472(92)90072-H.
↑ "Animal bytes: Leopard". Zoological Society of San Diego. Retrieved 13 February 2010. ↑ FishBaseFroese, Rainer and Pauly, Daniel, eds. (2009). "Chaetodon capistratus" in FishBase. July 2009 version. ↑ Cott, Hugh (1940). Adaptive Coloration in Animals. Oxford University Press. p. 373. ↑ Bos, A.R. (March 2016). "Soft corals provide microhabitat for camouflaged juveniles of the Blackspotted wrasse Macropharyngodon meleagris (Labridae)". Marine Biodiversity. 46 (1): 299–301. doi:10.1007/s12526-015-0332-x. 1 2 3 Breakfield, M.P. ; Gates, J.; Keys, D.; Kesbeke, F.; Wijngaarden, J.P.; Monteiro, A.; French, V.; Carroll, S.B. (November 1996). "Development, plasticity and evolution of butterfly eyespot patterns". Nature. 384 (6606): 236–242. doi:10.1038/384236a0. PMID 12809139. 1 2 3 4 5 6 7 French, V.; Breakfield, P.M. (September 1992). "The development of eyespot patterns on butterfly wings: morphogen sources or sinks?". Development. 116: 103–109. 1 2 3 4 Monteiro, Antonia (2015). "Origin, Development, and Evolution of Butterfly Eyespots". Annu. Rev. Entomol. 60: 253–271. doi:10.1146/annurev-ento-010814-020942. ↑ Reed, R.D. ; Serfas, M.S. (2004). "Butterfly Wing Pattern Evolution Is Associated with Changes in a Notch/Distal-less Temporal Pattern Formation Process". Current Biology. 14: 1159–1166. doi:10.1016/j.cub.2004.06.046.